Eleston, Ruizu mp3 player, Aesthetic edition. 8gb. Eleston, Ruizu mp3 player, Aesthetic edition. 8gb.. Shipped with USPS First Class Package. 1 RUIZU M1 Player. 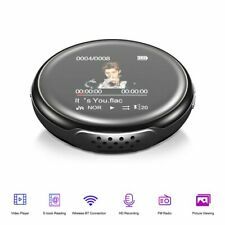 M1 MP3 player is a multifunctional music player that can be used to watch videos, read e-book and pictures, listen to FM radio and recording, and zinc alloy shell brings you good feeling. Model: X50. TF Card: Support 1-128GB. HiFi lossless sound quality highlight super bass and high pitch in music world. Besides, clip design is convenient to clip on the belt, on the pocket to prevent it from falling down. Model: X50. HiFi lossless sound quality highlight super bass and high pitch in music world. Besides, clip design is convenient to clip on the belt, on the pocket to prevent it from falling down. [HiFi Lossless Sound Quality]. D11 MP3 MP4 player provides you with multi-functional use experience. Also built with BT 4.0 version, the audio can be played through BT speaker and headphones. It is made of high-end zinc alloy and plastic, which bring you textured feeling and delicate design. Barely used Ruizu digital player, its condition is like new! everything on it works perfect! In addition, it supports various formats, supports TF Card read and play up to 64GB. With its multiple functions, this digital Player is your first choice to enjoy music, video, e-book, picture browsing, FM radio, recording and more. 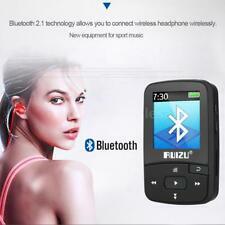 RUIZU X06 Mp3 Player with Bluetooth, Mp3 Music Player with FM Radio, 100hrs Playback, and 128GB Expandable, Blue. 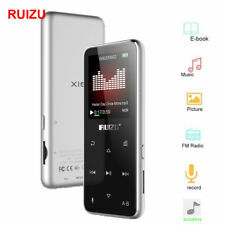 RUIZU X06 Portable MP3 player with Bluetooth. Allows you to listen to. 1 X RUIZU X06 MP3 Player. [HiFi Lossless Sound Quality]. AVI, ASF, DAT, VOB, MPG, MPEG-4, MOV, MP4, 3GP, MKV, WMV, MKV, MP4, and other mainstream formats. Audio Format: MP3, WAV, DRM WMA, OGG, APE, FLAC, ACC (including AAC-LC, AAC-HE, AAC) and other mainstream audio formats. [HiFi Lossless Sound Quality]. Support TF card read and play up to 64GB, which ensures you to storage your favourite songs freely. In addition, it supports all kinds of audio formats such as MP3, OGG, AAC, APE, FLAC, WMA, WAV, AIFF, DSD256. 【HIFI Lossless Sound Quality】 Excellent Sound Quality, Support Audio Formats: Mp3、WMA、OGG、APE、FLAC、WAV、 AAC-LC、ACELP、Audible ect. 【High Sensitivity Touch Button】 Designed with 6 Touch Buttons, Independent Locking and Voice Recording Key. (AUX mode does). Lossless music playing.Provide great quality sound for the array of music and convenient to download(Support MP3, APE,OGG and FLAC WMA etc.) And you can add for your music files(including audio book it supports). Support TF card read and play up to 64GB, which ensures you to storage your favourite songs freely. In addition, it supports all kinds of audio formats such as MP3, OGG, AAC, APE, FLAC, WMA, WAV, AIFF, DSD256. 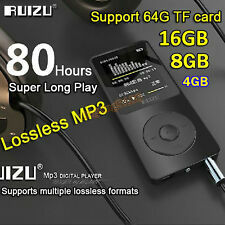 1 RUIZU M1 Player. It supports music format including WMA, MP3, APE, FLAC and WAV; video format including AMV and AVI; voice record format including WAV and MP3; and picture format including JPG, BMP. 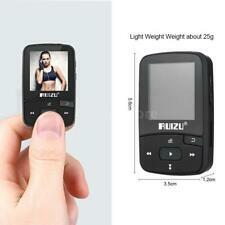 RUIZU X02 8GB LCD Screen Sport MP3 Player with FM Radio BLACK with English Man.. Excellent Sound Quality,Support Audio Formats: MP3/WMA/APE/WAV/FLAC EASY TO USE This music player designed with 5 operation buttons very easy to use even for small children, suitable size and light weight you can put it in to the wallet and you pocket, very good gift for you lover. A nice player for sporting, traveling, or jogging. It is also good for language learning, E-book reading, or FM radio playing etc. 28 language supported. 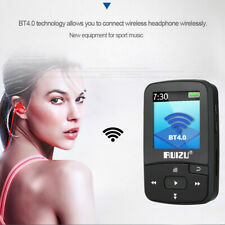 【Upgraded Bluetooth 4.0】Bluetooth MP3 Player, compatible with Bluetooth Speakers or Headphones. 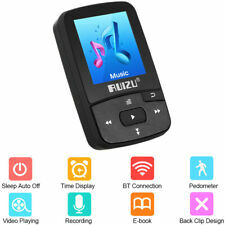 RUIZU X50 Wireless Bluetooth HIFI Mini MP3 Music Player Sport Clip 8GB HiFi lossless sound. MP3 Player Earphone. User Manual. Blue Color. 86g / 3.01oz. 16.8 9.6 2.7cm / 6.61 3.78 1.06in. Item Weight: Approx. Mp3 Player, RUIZU X02 Ultra Slim Music Player with FM Radio, Voice Recorder, Video Play, Text Reading, 80 Hours Playback and Expandable Up to 128 GB (Black). We're happy to help. These were manufactured to be used in the USA.